Lumber prices may be moving up and down of late, but they are certainly moving up and down at very healthy levels, helping to spur activities in the woods and in log sort yards. While the Chinese lumber market appears to be cooling down, the U.S. housing market is heating up, creating growing demand for Canadian lumber (Photo of TimberWest North Island Log Sort by Paul MacDonald). Ontario’s Woodland Biofuels Inc. is knitting technologies together to produce ethanol from wood waste—using feedstock from wood chips to pallets—for a multi-billion dollar market. B.C.’s Salem Contracting has proven its construction—and demolition— expertise year after year, with its most recent project being a $19 million upgrade at Interfor’s Grand Forks sawmill in southeastern B.C. As the result of a recent upgrade project, NorSask Forest Products is now getting more value from the lumber produced at its Meadow Lake sawmill, and it will soon be breaking ground on a 40 megawatt bio-energy plant. 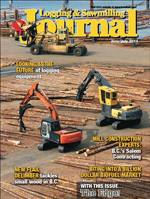 Logging and Sawmilling Journal talks with the top executives of the leading logging equipment companies—Cat, Deere and Tigercat—on trends in logging equipment, and how the companies are going to meet the future needs of loggers. Included in The Edge, Canada’s leading publication on research in the forest industry, are stories from FPInnovations, the Canadian Wood Fibre Centre, Alberta Innovates - Bio Solutions, Alberta Agriculture and Rural Development and Natural Resources Canada. highlights what was new in logging technologies and logging iron. New flail delimber working out in B.C. The use of a new-to-Canada flail delimber—the Chambers Delimbinator—in logging operations in B.C.’s Southern Interior region looks to be one of those situations where a new approach to harvesting is truly a win-win, with a very significant reduction in the time it takes to delimb small wood. The B.C. forest industry is working to meet its current—and future—people needs, through several initiatives, including classroom visits. The Canadian forest industry recently took an important step to verifying its environmental impact—and taking on competitive building products, steel and concrete. The Canadian forest industry wants to diversify beyond traditional forest products and sees opportunity in the growing bio-economy. What some forest companies are seeking are partners with expertise in producing non-traditional products, with the forest industry providing the feedstock. Woodland Biofuels Inc. falls into that category. The Mississauga, Ontario-based company has built a demonstration plant that produces cellulosic ethanol from wood waste, and is now seeking to partner with industry. It has completed a $12 million demonstration plant to showcase its technology. Woodland Biofuels is now looking for partners to invest $100 to $135 million in a cellulosic ethanol plant to take its technology to the commercial level. Alternatively, the company will license its technology to strategic partners wanting to build their own facility. The company expects to be among North America’s lowest cost producers of ethanol. It has already spoken to several large forest companies to gauge their interest in both Canada and the United States—and the interest level has been high. At present, the demonstration plant consumes about 7.2 tonnes of woody biomass per day. A commercial plant would consume about 50 times that amount, or 350 tonnes of woody biomass per day, to produce about 20 million gallons of cellulosic ethanol per year. Additionally, the heat necessary for the plant can be provided by woody biomass, which would require another 175 tonnes per day. 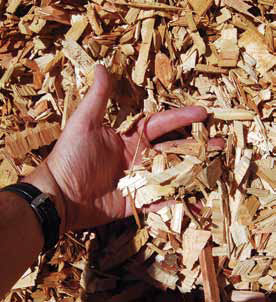 Since the demonstration plant’s requirements are relatively small, the company is able to acquire wood fibre such as construction waste and wood chips from suppliers in the vicinity of its demonstration plant in Sarnia, Ontario, to meet its needs. But Nuttall says the best location for a commercial plant would be right next to the source of raw material, with the feedstock coming within a 220 kilometre radius of the plant. What’s particularly noteworthy about the technology employed by Woodland Biofuels is that it can use any part of the tree, meaning that it can use both forest slash and wood residuals produced from conventional sawmill, pulp mill or engineered wood product plants. In addition to forest industry waste, the ethanol plant can also accept urban wood waste, industrial wood waste, pallets, wire reels, demolition wood, cardboard, and paper. Nuttall says the only requirements are that it is clean material processed down to two inches or less and it must be dried to between 10 and 30 per cent moisture content. The process doesn’t favor hardwood or softwood. Mixing different materials may impact the quality of the synthetic gas produced in the initial step of the company’s process, which could have an impact on yield. However, the quality of the ethanol stays the same. Woodland Biofuels is currently analyzing where it makes the most sense economically to pre-process the feedstock, whether on or off site. To ensure that the plant never runs short of feedstock, the goal is to negotiate long-term supply agreements at the lowest possible cost. However, Nuttall says based on what the company has witnessed so far, it is likely that each plant’s supply chain will be rather unique, depending on where the plant is located and what potential feedstocks are available. Woodland Biofuels has evaluated the cost of all potential woody fibre feedstocks that could be used in its process and has determined that it can produce ethanol competitively based on current prices. From a marketing standpoint, the end product is being promoted as ethanol, but without having to use a potential food product such as corn as the raw material in the manufacturing process. Nuttall says it’s no accident that the demonstration plant is located in Sarnia at the Bio Industrial Innovation Centre at the University of Western Ontario. Sarnia is renowned as a chemical manufacturing hub in Canada, and the company has been able to attract highly skilled chemical industry individuals with years of experience to both develop and validate its manufacturing process. The plant manager, for example, worked for Dow Chemical for 35 years traveling the world to start up chemical plants. Also, it has partnered with a company called Zeton Inc, a well-known global demonstration plant engineering and construction firm based in Burlington, Ontario. The Ontario and federal governments have also supported development of this technology, with Ontario kicking in $4 million through its Innovation Demonstration Fund and the federal government contributing $9.8 million through Sustainable Development Technology Canada. Four private equity entities, the MaRS CleanTech Fund, Investeco Capital, Greenrock Capital Partners, and Middleland Capital, have also recently come on board to support commercialization of Woodland Biofuels’ technology. The company received some additional funding news in June. Patricia Davidson, Member of Parliament for Sarnia-Lambton, announced funding through the Federal Economic Development Agency for Southern Ontario (FedDev Ontario). Under FedDev Ontario’s Investing in Business Innovation (IBI) initiative, Woodland Biofuels will receive a repayable contribution of up to $800,000 to operate its plant. “Our investment in Woodland Biofuels will lead to opportunities for job creation, growth and long-term prosperity in Ontario, and will strengthen Canada’s position as a global leader in clean energy,” said Davidson. FedDev Ontario funding for Woodland Biofuels has enabled the company to attract up to an additional $2 million in venture capital financing through the MaRS Cleantech Fund. The company is not selling breakthrough technology but a biomass to ethanol conversion process that combines a variety of known and proven technologies knitted together in a patented process called Catalyzed Pressure Reduction (CPR). It converts biomass to synthesis gas, or syngas, and then into ethanol through a series of catalyzed chemical reactions and then distillation. Woodland Biofuels says that catalysts and catalyzed reactions are the backbone of the chemical manufacturing industry, accounting for 60 per cent of all chemicals produced today and 90 per cent of chemical processes. Nuttall says what sets Woodland Biofuels apart from other ethanol producers—besides not using corn in its manufacturing process—is how it combines known processes in a unique way, so that its process is more efficient and makes more complete use of the feedstock. The technology employed by Woodland Biofuels allows it to use any part of the tree, from forest slash and wood residuals produced from logging and sawmilling operations, to urban wood waste. 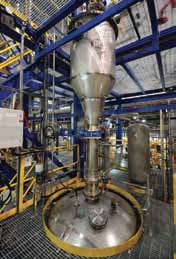 The Sarnia demonstration plant has two main purposes. The first is to validate the integration of all its components for producing ethanol. This is the first time that all the major steps have been fully integrated. The second is to gather all the data it requires to scale up to a commercial size production facility. What’s primarily driving growth in the market for ethanol are government regulations requiring the addition of ethanol to gasoline. The U.S. requires that a gallon of gas comprise 10 per cent ethanol, and under its upcoming renewable fuel standard, that is increasing to 15 per cent. “In the United States alone, it was a more than $30 billion market last year, and that market is expected to grow to over $90 billion by 2022,” says Nuttall. “So it is already a huge market, and unlike other huge markets, it’s growing rapidly.” Right now, almost all ethanol is produced from corn and the price of corn has a direct impact on the price of ethanol. However, Nuttall says that Woodland Biofuels is not tying its fortunes entirely to government mandates. Woodland Biofuels can also accept other feedstocks in its manufacturing process such as municipal solid waste, agriculture waste and food processing waste. It is starting with wood waste but will eventually test and introduce other feedstocks as part of its development program.